Discussion in 'Vendors' started by woody's wheel works, Mar 5, 2009. FYI,,,,this thread is dedicated to synthesizing and collating as much info on this topic in one easy to use place. I'm starting this off with a quick review of the highlights advantages/disadvantages/trade-offs of the conversion,,,and providing some links to threads/posts/pictures that provide you with interesting info/opinions/data accumulated over the years. I'm doing this to cut to the chase on this topic and help ease the pain of wading thru tons of searches..i need your help too,,,so if you find some new and better data or links,,,POST em!!! 5,, with stock gearing ,,the smaller rear wheel puts the oem 17/42 gearing spot on the money for snappy acceleration,,equivalent to you all lowering your gearing to 16/42 or 17/45 when using the 21/18 oem wheels. 1st track day on the 950. What a blast. This bike can do anything. You can see here that I gumballed up the sides pretty good, but still had the nubs in the center. ..SEND IN YOUR PHOTOS AND I"LL LINK HERE!! </td><td class="alt1" id="td_post_3890080" style="border-right: 1px solid #575757"> I've weighed in on this before but I'm bored and taking a rest from studio chores so what the heck. I've got two sets of wheels from Woody: 21x1.85 & 18x2.75 and another set 19x2.5 & 17x4 (same as the BMW GS). I have about 10,000 miles on each set in a variety of terrain. 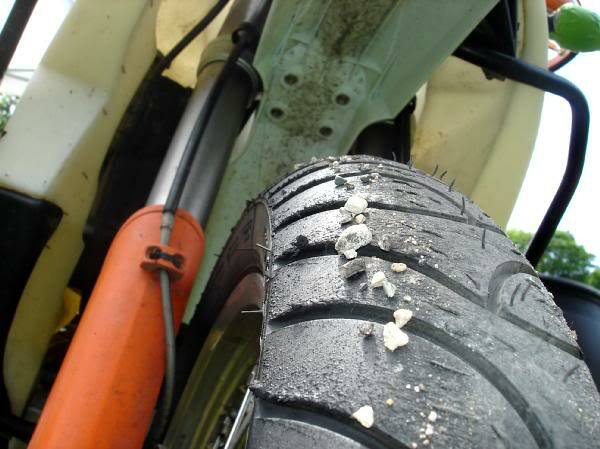 I've ridden all different tires including Scorpions and TKC80's on both wheel sets so this is a fair comparison. These wheels are great off road. The stock ones are weak but the ones Woody built are bullet proof. The larger size tracks very well and isn't as easily deflected. It rolls over large obstacles very well. In sand it works very well but the handling is heavy and slow but with a tendency to head shake. On pavement it's vague and it's possible to lose the front if pushed to the edge. It's not so much ultimate grip but the speed with which the front will lose traction once it starts to slide. You can still ride it quickly on pavement. This is frankly my preferred wheelset. The bike is a compromise being really too large to do seriously technical off road work. 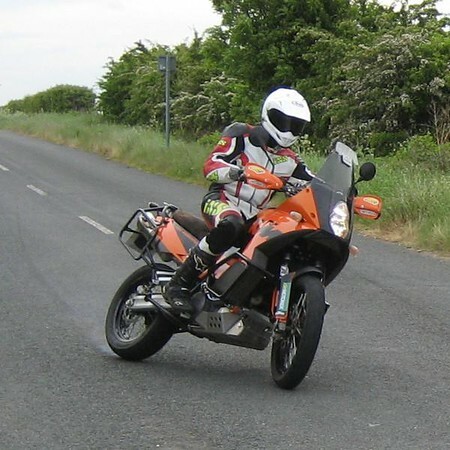 It's best (in my opinion) as a GS type do everything bike. Everything tends to mean pavement. The smaller wheels are much more stable. 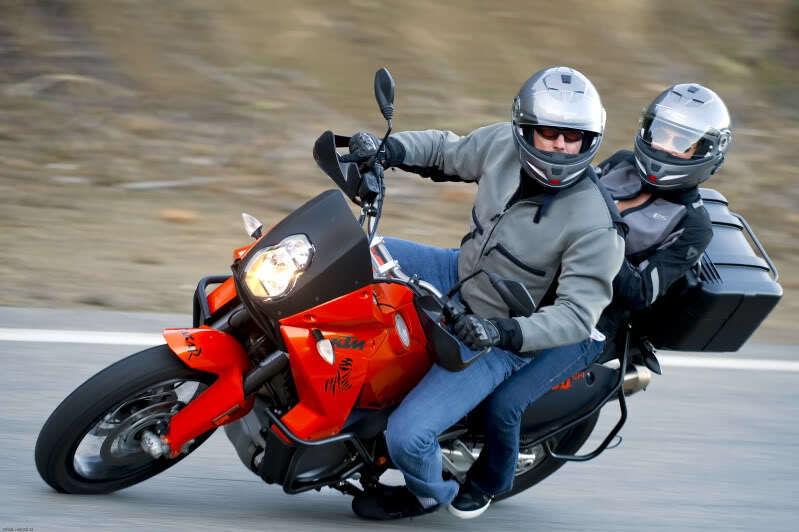 This is contrary to what you may hear from KTM but the smaller front actually eliminated the head shake I used to get - go figure. 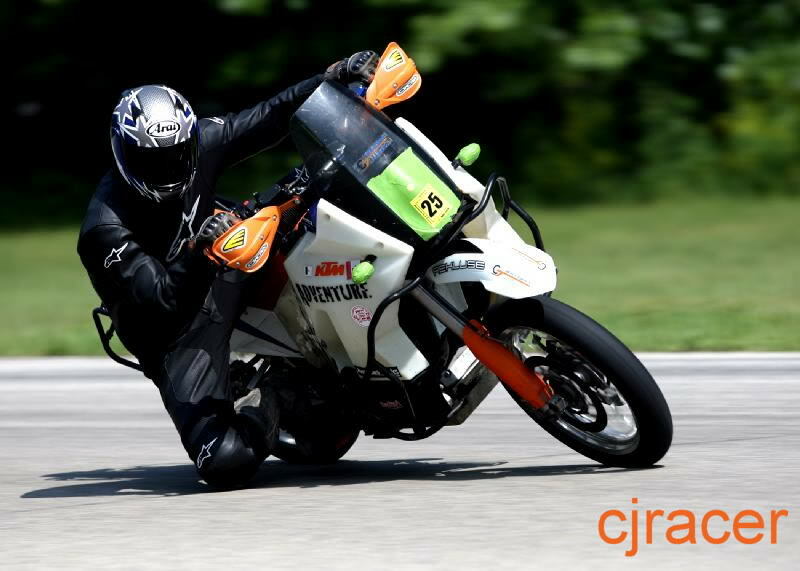 The bike transitions quicker, holds a line better in a corner and has more grip and more rubber up front to make a front end slide recoverable. This is on pavement. On dirt it's still better. Maybe ever so slightly more vervous but I like it. In sand it's pretty miserable and augers in and no amount of throttle seems to pick it up. In rock and rough stuff it's still pretty good but doesn't track nearly as well as the bigger wheels. Overall I think the 17/19 is better in dirt than the 21/18 is on pavement. I've got 24,000 miles on my bike and now that I've done the crazy stuff with it I feel it's best for exploring the less traveled path but not so good at blazing a path. I'll keep the big wheels if I go to Baja or Alaska but otherwise I like the smaller set. Here's a shot of Eli riding over Rollins Pass. This is a pretty difficult pass and we knew of a few GS riders who tried but couldn't do it. The big wheels are essential for these big rocks. Personally I think the bike should come with 17/19 as standard (and so does everyone who's ridden my bike with those wheels) but the S model should come with the big wheels. It's nice to have both though. and to introduce another or even better yet share that QUALITY experience/domain with another is truly one of my life's great pleasures. i refined and simplified the notions of the big Q experience after digesting Pirsigs tome...Zen and the art of mc maintenace,,,,whatever it is ,has to work/taste/etc as well as it looks,,,and look as well as it works /etc. Consistently,,,most folks arrive at similar conclusions when given the opportunity to ''experience the difference'',,,hence BYOE mcdonalds hamburgers and sleeper hotrods don't make the cut...ie the former doesn't taste as good as the pictures and the later doesn't look as good as it runs. i assert that if i took 20 riders out and let each one try a 950 shod with the appropriate tires on the rim combinations below and have them run a test course that runs the gamut of single track,,forest trails,,hard pack dirt roads,,curvy canyon roads,,,freeways,,and a road race course that at days end they would agree with Sakurama's analysis. at days end,,,when you've taken your stock oem 950 over all the terrain and pounded as much pavement as Sakurama has....you too will more often than not find that taking your 950 over rugged mountain passes or canyon carving would have been a lot easier/and perhaps more fun on appropriately sized and shod wheels.....or maybe even save that territory for a more appropriate steed. Pass the word,,and chip in!!! As we all post in this thread i'll try to move the contributions into the above categories via links and cut n pasting. Iocaine and ELC888 like this. hey guys,,,help me add your FAQs to this thread.. I have a question about wheels for an 08 530 exc. I am looking for a second set of wheels to keep more street oriented rubber mounted on. Something like the tires the come on the adventure. 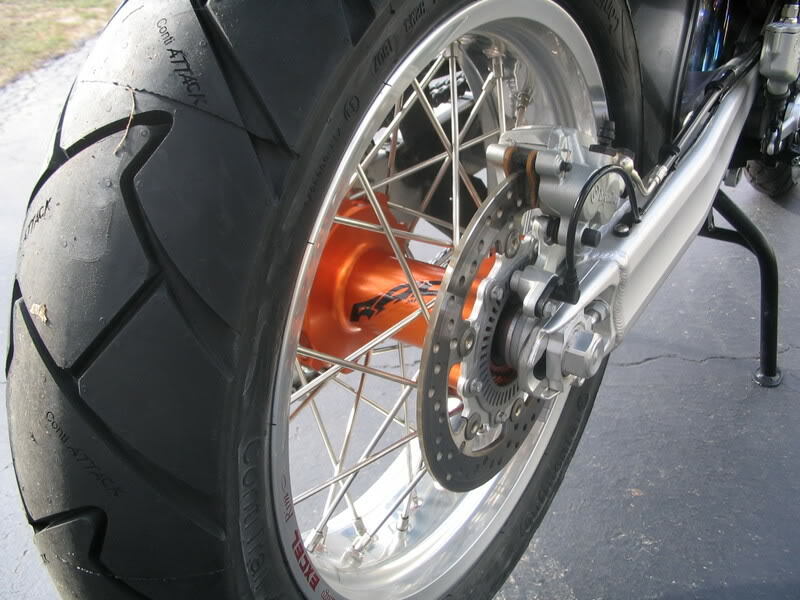 I am assuming I don't want to go to supermoto wheels because I don't want to have to change brake mounting points, gearing etc. 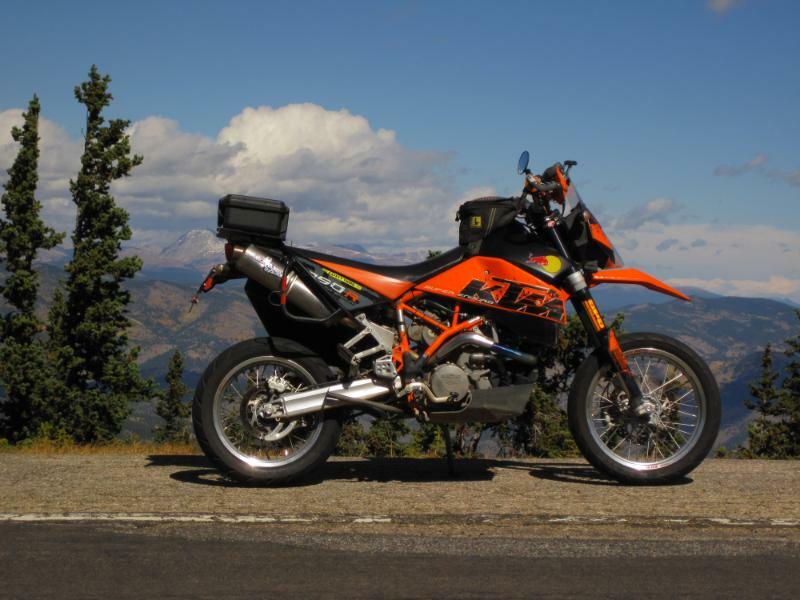 I just want to be able to easily swap wheels so that if I am going to spend the day on the road (dirt or paved) I can have a better ride than I would with the normal non-DOT knobbies. So, what is the best rim/hub combo for a reasonable price and do I need a cush hub? 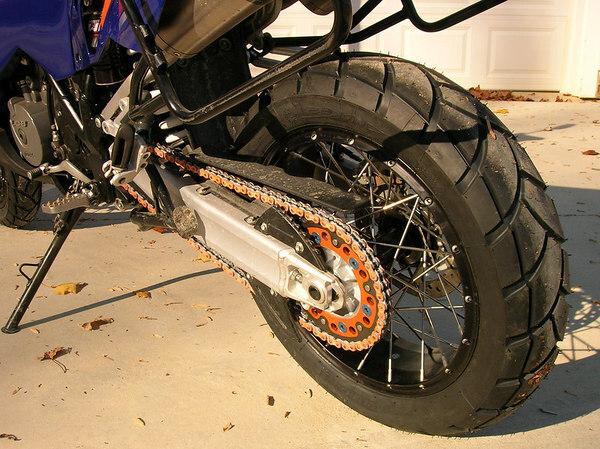 How about a 19/17 set for a 950 Supermoto? 5.0 on the rear? 2.5 on the front? I wanna blast some dirt roads!! Well...cool! What are we talking here? What's needed? 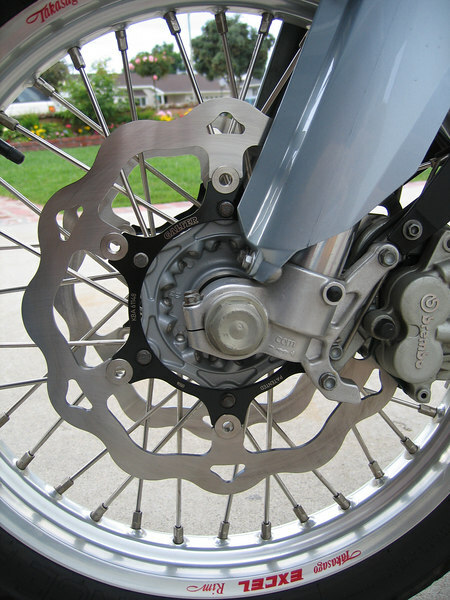 I'm assuming an ADV sprocket carrier and hub for the rear, but what about the front hub and rotors? we have everything ,,call the shop ask for Zach he'll take good care of you,,i'm in germany trying to get the bottom of the Behr rim dilemna.. 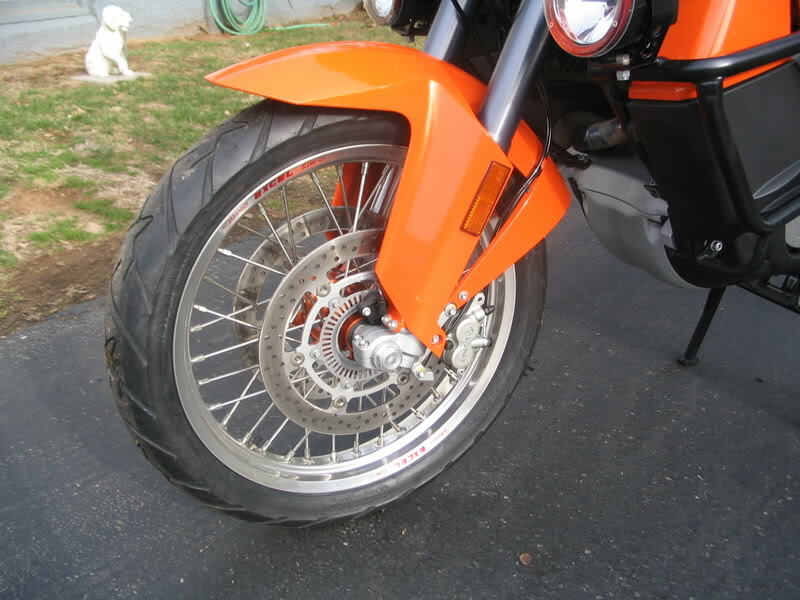 Does anything change with the abs on the 990's with the change in wheel size? I guess as long as the abs ring stays the same, the brakes function the same? so far there have been no anomalies reported,,,there's a post from sakurama detailing switching your speedo settings..
Not sure if i am being a plonker , but how do you run a 19/17 set up on spoked wheels with tubless tyres ??? I just moved my 19/17 set-up from my 950 ADV to my 950 SE. All I had to do was remove the right side disk brake and use the EOM SE spacers and I was good to go. The set up is wicked fun! 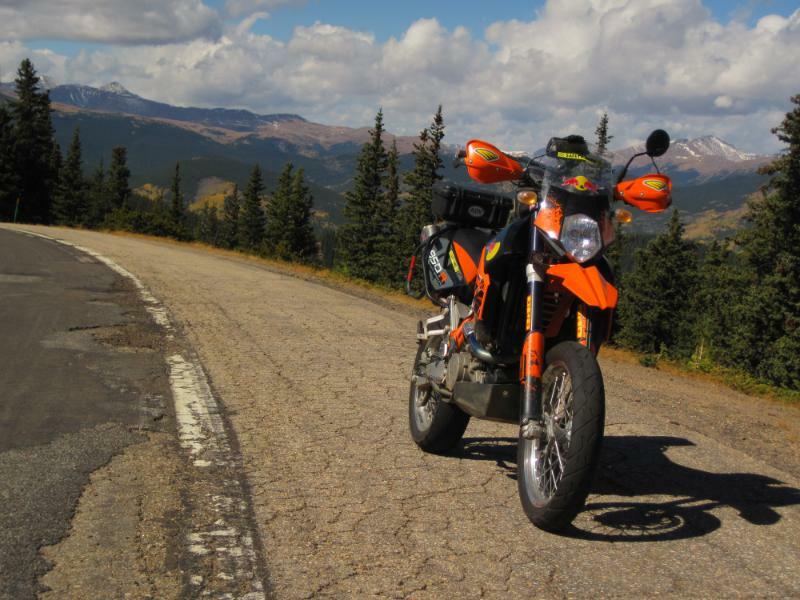 Yellow Pig,,thanks for the awesome photos,,now go bash that thing up independence pass again and provide some detailed feedback like ya did on your first test ride with that combo on your first 950!......or were these pics taken on the pass??? OBTW,,,funny i was up Independence pass just 36 hours ago,,,had my wife's BMW325i,,,,honest injun ,,i was thinking of you as i let the cob-webbs out of the ol brain and let her rip,,,,WHAT a HOOT,,,Fahrvergnugen. .. This was just a quick mid-week romp up Mt Evans, had to sneak a ride in before the snow flew. Once the Conti Trail Attacks, which by the way are awesome and stick really well even in cold conditions, are done I plan on giving the Michelin Pilot Road-2s a shot. The wheels seem to work better on the SE than on the ADV. Not sure why. 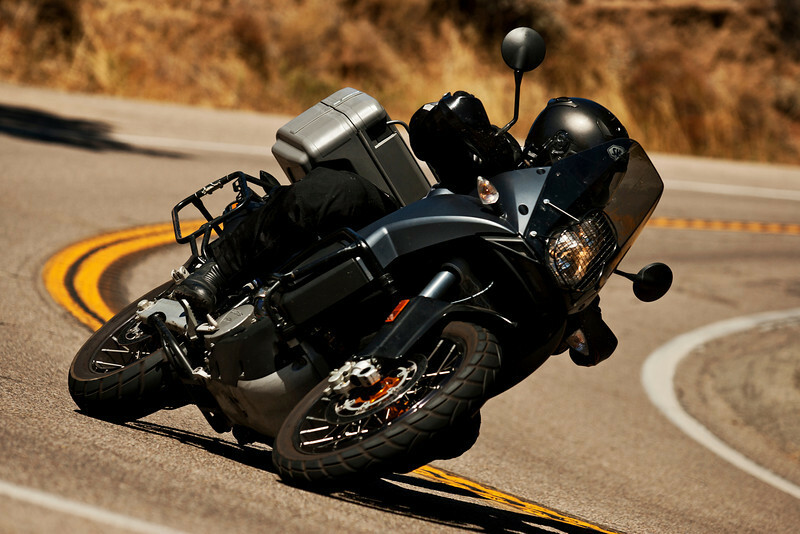 Most likely it's the better suspension, more aggressive riding position and the lighter weight up front. The bike seems more flick-able. I love how the bike feels and handles. 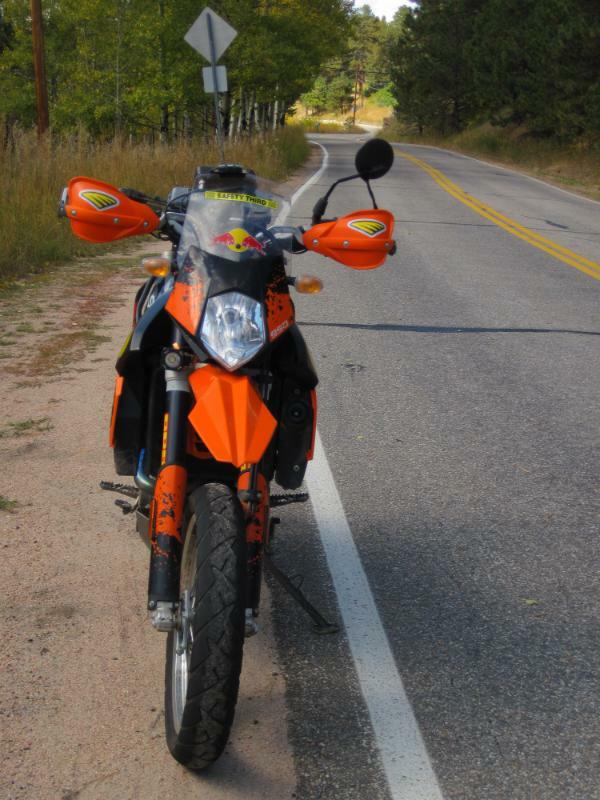 It's eve better than my old DRZ400 Super Moto w/ 17 all around. PS: Remember it's Aprilia CapoNord, not Caponard, which in Italian means North Cape, the most norther point in Europe. For the Europeans it's the equivalent of Ushuaia, the souther tip of the American continent. Next time I'm going with CapoNord (thanks Y.P.!!) rims, too. Mine were supposed to be sealed...it worked for a while but there are tubes in both ends now. I was tired of the slow leaks. I don't think the spoke sealing is the problem...I think the rims are the problem. I don't think the beads seal right. Also...Woody, I spoke earlier (in the other thread) about my front wheel needing truing...turns out it's fine, it was an out of round tire. That'll do it! I'm interested in a 19/17 set for my 06 625 SMC. Stock hubs, Excell rims, more for dual sport than street. What would you suggest, and a rough idea on cost, shipped to Calgary, AB? 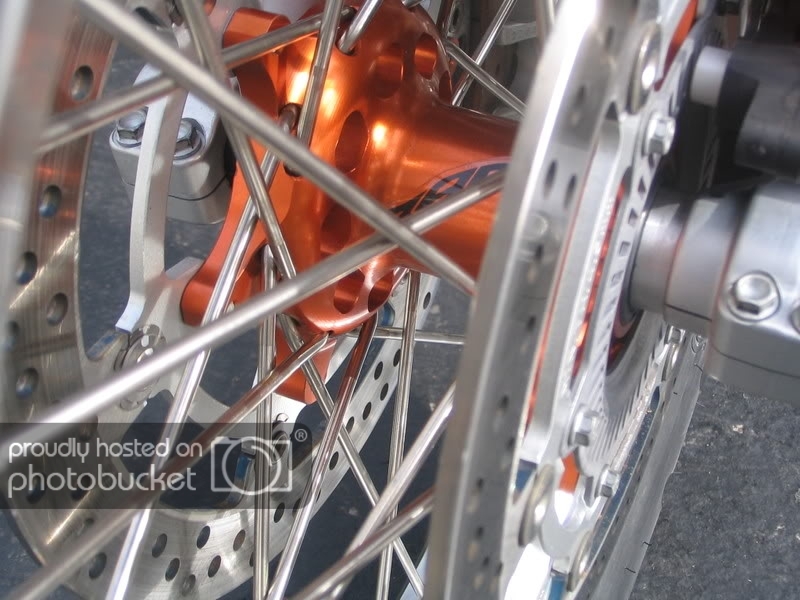 Will I have interference problems with the spokes and the calipher, with the stock rotor? I got Silver and want Black! So what tires are available for the 19/17 set-up? Which are deemed the stickies?